Our Client, Grind Coffee, gave us a challenge – to design their Pop-Up Cafe which will run for 9 months before they eventually move into a permanent location. The brief is to design a space that resonate with their group of loyal customers whom has been waiting for their return, at the same time rebrand their product to be easily recognisable in the competitive coffee house market. We readily took up the challenge without second thoughts as we fall in love with their coffee from the first sip. 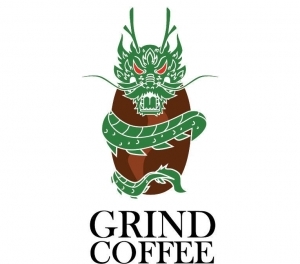 The logo of the coffee joint is a Dragon coiling around a coffee bean. The client tells us how proud they are of this logo as it is something unique that their customer can relate to. We took this logo as the starting point of the design, and the elements in the cafe revolve around this concept. The goal is to create a cafe that is strikingly recognisable from the moment someone enters the shopping mall. The main element within the cafe is the coffee counter, which serves as a working counter where the barista shows off his/her skills to the customer seating in front who is eager to fill his/her desire for a good cup of coffee. This working counter is designed in almost full length of the shop width to face the atrium of the shopping mall, with a dragon-like scale pattern draped over the vertical surface of the high counter. 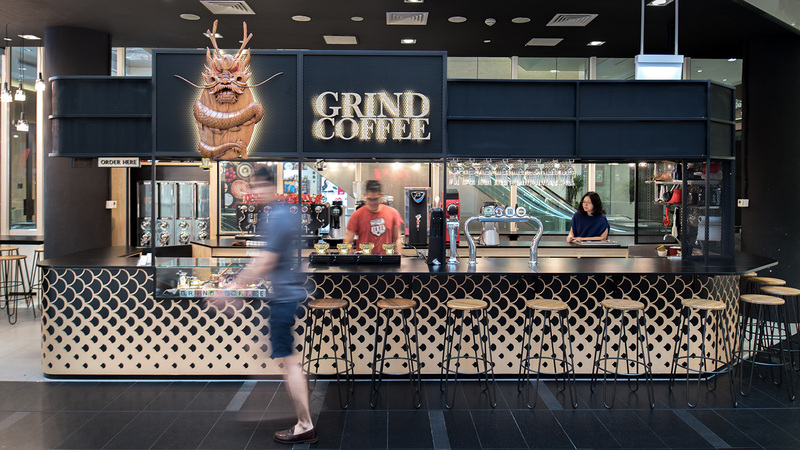 Together with the wooden dragon head logo on the top, the working counter is like a dragon in full display to passer-by, attracting their gaze. And truly, the dragon has awakened.